The Canadian government recently announced that Canada would increase its immigration intake. Immigration Minister Ahmed Hussen made the announcement that by 2021 Canada would accept 350,000 individuals a year as part of a three-year immigration plan. The majority of these works will come under programs designed to fill skill shortages in the labor market. Economic immigrants are individuals that come to Canada for career opportunities. They’re accepted based on their skills, work experience, and education. In 2017, the top five jobs for applicants were information systems analysts and consultants, software engineers, computer programmers and interactive media developers, financial auditors and accountants, and administrative assistants. Hussen explained that economic immigration is desperately needed across the country. He cited a worker shortage and aging residents as primary reasons for the need. At this time the government has not yet announced where these immigrants will be settled. The government cannot tell immigrants where to settle. Major cities such as Toronto, Vancouver, and Montreal are still the most popular among immigrants, however, Calgary and Edmonton are also rising. The government is trying to incentivize immigrants to move to smaller communities though. Offering incentives, highlighting opportunities, and creating infrastructures to support immigrants are all apart of their plan to draw economic immigrants. Although this increase in immigration is a positive one, some are calling for Canada to accept more. Hussen acknowledged that the country could support a larger number but that they were taking a “measured approach”. Housing these new immigrants is a big concern, especially since the larger cities they’re attracted too like Toronto and Vancouver have an affordable housing shortage. To help relieve this issue the government has pledged $11 million to the province of Ontario to help with housing, though the provincial government is asking for more. 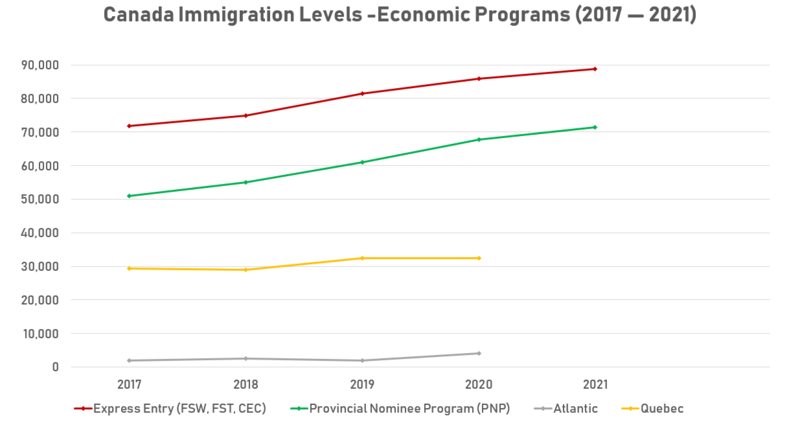 Hopefully, these new immigrants will fill the gaps in Canada’s economy without putting too much of a strain on the already fragile housing market.